As I have been planning my trip to Bali, I have been wanting to receive some extra money for my trip. So, I decided to visit my trusty old friend– Feng Shui! In Feng Shui, one of the most popular ways to increase the amount of money that flows into your home is to place a water fountain at your front door. I found a cool ceramic bowl in my garage, bought a bamboo water spout and placed it at my front door. So excited for the money to flow in. The money was not flowing in. In fact, it was flowing OUT more than usual. You must make sure the water flow is flowing TOWARDS your front door, not away from the door. That way the water flow (aka your money flow) is flowing TOWARDS/INTO your home versus AWAY from your home. Well, that’s easy to fix! 15 minutes later, I got a notification that I sold another item FULL PRICE from my clothing boutique!! YAY!!!! THIS FENG SHUI STUFF REALLY WORKS!!! Then, to my dismay, I discovered a crack in my ceramic bowl. Water was leaking out of my fountain. We don’t want my money leaking out!! Off to Homegoods I went. In search of a better bowl/pot/vase/container for my fabulous DIY Feng Shui water fountain. I felt so many good vibes. And the copper bowl looked so RICH! CHA-CHING! I MADE ANOTHER SALE (at full price!)!! 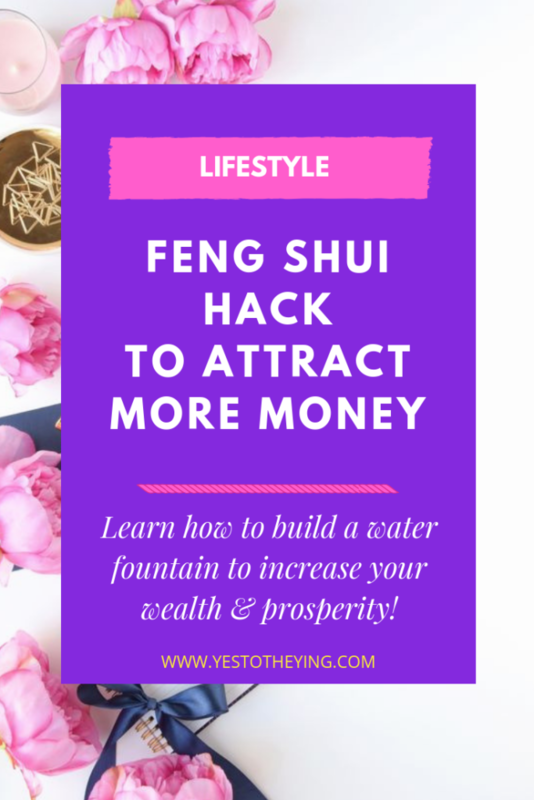 FENG SHUI WATER FOUNTAINS TOTALLY BRING IN MONEY INTO YOUR HOUSE!!! So, why does this Feng Shui Water Fountain work?? Water fountains activate wealth, opportunity, health, and vitality. The flowing water symbolizes a flow of money and abundance into your home. It activates positive energy which attracts prosperity to you and your bank account! c) it was more cost effective! Choose a style that fits the style of your home— the more pleasing it looks to you, the more wealth will flow into your house! Make sure that your fountain has both a generating and collecting point. The generating water would be the spout (you can purchase the bamboo one I got here) and a collecting point (the bowl or pot). These represent two types of money: income and savings. And clearly, you want both! Keep the water clean and clear. Clean water = clean positive chi/energy. Positive energy = positive cash flow! So change the water once a week and remove any calcium deposits or debris. Do place the water fountain on the left side of the front door (as you are looking out from the door). This magnetizes the money to flow to you. Don’t use a red bowl/vase/pot/fountain. Red symbolizes fire. And fire puts out water. You will be “burning” your money as soon as it comes in. Don’t have a fountain that is a disappearing fountain (click here for an example). This means that your money will disappear aka as soon as the money comes in, the money will go right out to pay bill after bill. Which means that you will never get ahead financially! Don’t allow your water to get dirty or muddy. Dirty water creates bad health and money problems. Don’t have the water running at night or where you can hear it when you sleep. It signifies that your money is seeping out while you sleep. Don’t place the water counting on the RIGHT side of the front door (as you are looking out from the front door). This encourages infidelity in marriages and romantic relationships. TO INCREASE YOUR ABILITY TO ATTRACT MORE MONEY INTO YOUR LIFE, BE SURE TO CHECK OUT MY COACHING PACKAGES: READ MORE ABOUT THEM HERE! In 1:1 sessions, I will pin point exactly what is blocking you mentally and emotionally from making more money and then custom make an easy to follow plan of action that will help you attract all the money you want into your life with ease! I hope this inspires you to go out and make your own Feng Shui fountain! Comment below with any questions or insights you have. And if you make one for your front door, let me know how much money it brought you! YOU ARE DESERVING OF ALL THE MONEY YOU DESIRE! And Success starts by saying YES to YOU!